Just as we heard, Sony might indeed be using a touchscreen tech on the Xperia ZU phablet that lets you doodle on it with a regular pen, not only a stylus, or even a pencil. Whether it is Neonode's tech or some other of those beaming bezels, remains to be seen, provided that the photo above is legit, of course. Alleged photo of the device already leaked out yesterday, chillaxing in someone's lap, resembling very much the shape and form of the Xperia Z/ZR handsets. The source publication here confirms that the phone is indeed built in the Z line heritage, as it is waterproof as well, and IP58-certified at that, meaning it can be submerged in up to 5 feet of water for 30 minutes without damage. 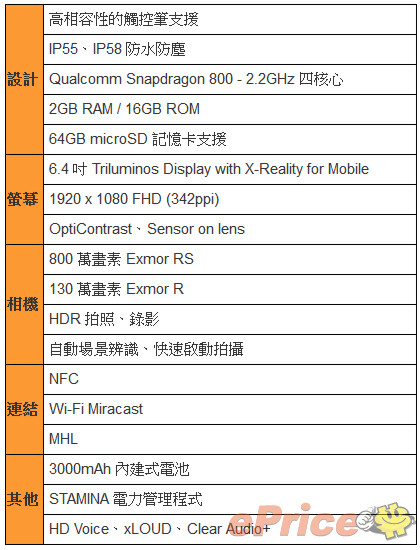 Moreover, the rumored specs on the right here confirm our best hopes for a 2.2 GHz Snapdragon 800 processor and a 6.5mm thin frame, so we can't wait for the phablet that holds kittens to be flaunted in Europe around June 25. The French teaser for a demo on July 4th also depicted a very thin frame and a pen that writes "don't forget the notes in your schedules," so the scribbling functionality will be focused on indeed. apparently, the neonode touch tech on the togari is true. with those abnormally thick bezels, it would appear the neonode tech is in there. i just hope it also supports that other input type neonode demonstrated — the one where a player can play a racing game by just moving hands beside the device, without touching it. Stamina mode is just a software gimmick like every other battery saver. You get the same poor battery life on the XZ whether it's on or not. I hardly disagree on what you have said, stamina mode is not just a software gimmick! well battery usage will depend on the user and how he uses the device. don't underestimate the Note III (just saying) we all know it will beat this device, but don't get me wrong, that doesn't mean the Xperia ZU is bad at all. Um... wouldn't a pen leave a mark if not a scratch? I think pens and pencils aren't hard enough to scratch Dragontrail or Gorilla Glass. Pens would probably leave ink, but you should be able the wipe it off . nobody wants to write and then wipe it.it looks too much awkward. Im a bit disappointed with the design to be frank, but the specs on paper are fantastic. It's not only Sony man! Nokia with their Lumia series, Samsung with their Galaxy series, LG with their Optimus series, Apple with the iPhone...all look the same. And now HTC is coming up with the similar to One look alikes. Sh*t that's a real pencil!!!! so an oversize xperia Z, they better market this thing as a tablet, because from the picture, I don't think that will fit in the pocket. But when Samsung does it with the Mega 6.3, everyone seems to have no problem at all! Why with Sony's 6.4? Sorry but for me this is tablet not phablet!this same Mega 6.3 And if Samsung make Note4 bigger than 6" it will be a tablet! I know that. I'm replying to Jason's pocket-ability issue regarding the Sony 6.4.
do you think 6'' is small? i think you must check galaxy mega 5.8 if i have the same point of view like you, for me anything bigger than 5.5'' it will be a "small tablet"
bcoz nobody wants to buy mega 6.3 with mediocre specs but one might consuider zu because of exclusive feautures and top end specs. would you care to explain why ?